Victor Cruz Touchdown @ The Puerto Rican Day Parade..
Calle 13’s Residente Gets Hitched! Rapper René Pérez Joglar (aka Residente) of Calle 13 is officially married! 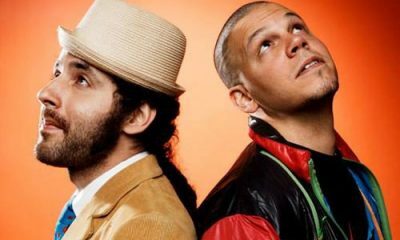 Calle 13 are planning to build a school in Puerto Rico. ESCANDALOS DE FARANDULA: Tragedy hits Residente of Calle 13, Juanes Crosses Over, & Diddy Sits in Judgment! Catch up on all the gossip from your favorite celebs!